Alongside special guests, Philippa is excited to bring you an evening of entertainment, storytelling and inspiration for women and girls, in support of Compassions Child Survival Intervention Program in Togo. 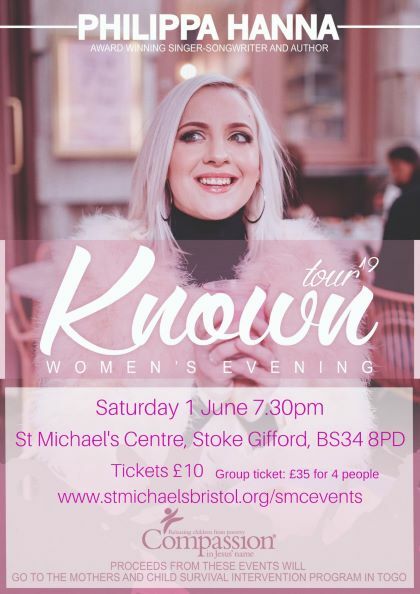 The ‘Known’ tour is a fabulous opportunity to bring together girls of all ages for an unforgettable event in support of an incredible cause. Philippa will be sharing her most well-loved songs alongside her honest and relatable stories with a sprinkling of humor. Over a ten year career Philippa has toured with the likes of Leona Lewis, Lionel Richie, Little Mix and many more. She has played over 1000 shows in 25 countries, released 5 studio albums and visits as many as 150 churches a year. Her latest book ‘Amazing You’ aims to encourage and inspire others to overcome fear and fulfill their potential. Alongside her husband Joel, the pair share their trademark feel-good music, thoughtful songs and moving testimony in a show that is both inspiring and appealing to people of all ages and backgrounds. ‘Known’ is the title of an upcoming single for Philippa and aims to spread the message that all people deserve to be loved, protected and ‘Known’.